 At Owenhouse Cycling, we’re always looking for ways to expand and improve the biking community. 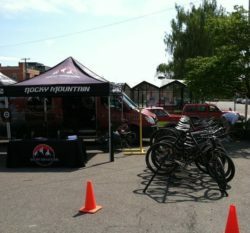 Outside of our regular work hours you might find us hosting bike clinics in our shop or putting on events around town. 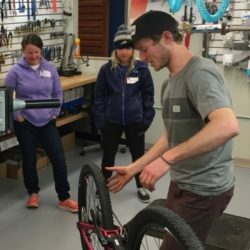 Throughout the year we host a number of in-house bike clinics and other events to help you build your biking knowledge. 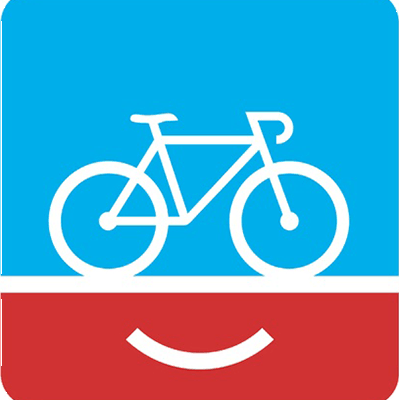 These FREE hands-on clinics are designed to help you learn the basics about bikes. 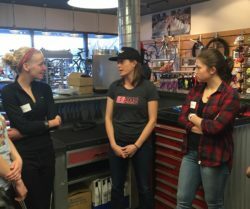 The clinic covers everything from bike anatomy and preparing for a ride to fixing flats, broken chains, and other minor adjustments to help you pedal with confidence. No need to bring anything, just show up ready to learn. Please check our Facebook page for information on upcoming Beginner Clinics. The Advanced Clinics are for those who already have their basic bike skills dialed in. For $50 you can take advantage of this great opportunity to learn even more about your bike. You’ll leave the clinic with your bike tuned, lots of good knowledge, and a free cleaning kit (worth $50 retail)! For these clinics you’ll need to bring your bike and clothes that can get dirty. We’ll partnere you with another attendee and one of our mechanics, then walk you through the stages of tuning your bike: washing/degreasing, brake adjustments, shifting adjustments, bike inspection, etc. Please check our Facebook page for information on upcoming Advanced Clinics. Owenhouse works closely with our local Liv Ambassador, Karen, to host a number of women’s only events at the shop. 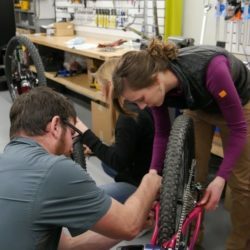 These events range from bike maintenance clinics to learning about riding technique. The subject matter varies widely but more information will be available as the events are scheduled. Please check our Facebook page for information on upcoming Liv sponsored Clinics. Not everything can be done from within the shop. Sometimes we need to get outside to make things happen. What better way to meet fellow riding enthusiasts and try out that new trail or stretch of road than a group ride? Check our Facebook page or stop by the shop to find out when we have one coming up. And if we don’t have one planned, we may know of another group in town that has something in the works. At least once a year our reps roll out their demo vans so you can test ride their newest bikes. It’s a great time to compare bikes across brands or just test ride something completely different, no strings attached. We usually host these events in the south (back) parking lot of the Bozeman Library where riders have access a number of in-town trails. A credit card and photo ID are required to demo the bikes. Depending on how long our reps are in town, these events may also include a group-ride. Learn more about upcoming demo days through our Facebook page. 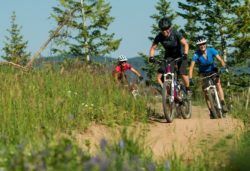 Bozeman and the surrounding area has tons of great trails, but those trails maintain themselves. Trees fall, ruts form; erosion happens. Someone needs to step up and fix these things, and that’s where we come in. 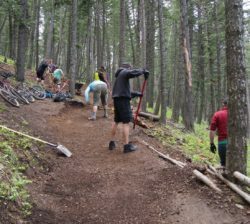 Working in conjunction with other local groups we organize trail days throughout the riding season to keep our trails in good condition. You’ll want to bring water, sunscreen, gloves, and dress appropriately. Lunch will usually be provided, as well as some swag giveaways for volunteers. Tools are also be provided but feel free to bring along your favorite trail tools. Carpooling may be available. Learn more about upcoming trail days through our Facebook page.